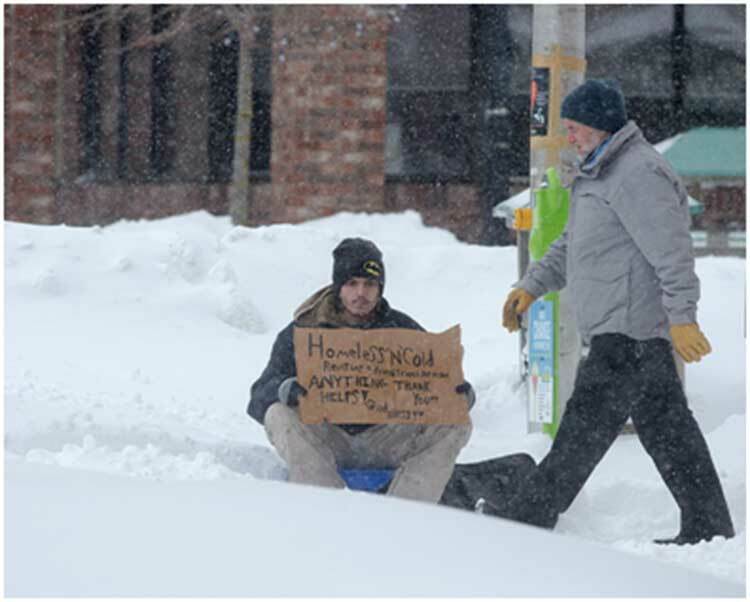 On Finding A Homeless Person In A Blizzard! 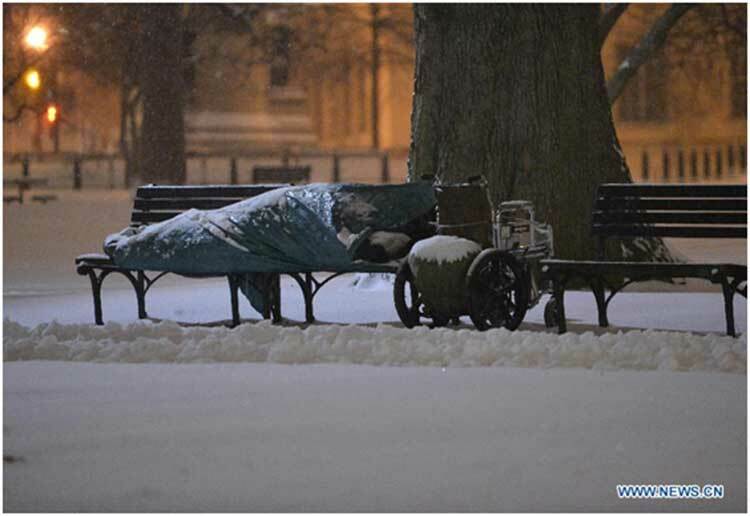 Personally if I were to find even one homeless person sleeping in the icy snow not far from my home, I’d make it a habit to always nightly check the area for others in the same condition and, in the least, call a local shelter for a pick-up of him, give him hot tea and a sandwich, as well as tuck a warming blanket around him from my closet to donate to his care while we together waited for the shelter’s pick-up action. I’d also go all out to help him feel safe so he’d accept the pick-up activity. After all, it might greatly scare him to be taken to some unknown place. He might be that fragile emotionally after whatever trauma that he could have suffered that landed him abandoned in a street! Then I’d continue to try to reassure him as we lifted and loaded him, and his wheelchair into the transport vehicle. What if there were no pick-up activity? Then I’d try my best to induce him into my car and cart him off to my Pip Shelter – Health Center at 701 Main St, Worcester, Massachusetts. If I couldn’t get him there for some reason such as the roads being impassible due to snow accumulation, I’d let him sleep in my car – a better place than out in the open while exposed to raw, painfully freezing weather. I also would not want him in my house as he may have lice, TB, scabies, another contagious disease or a mental disease that could make him dangerous to be in my rooms. However, I couldn’t abandon him to possibly literally freeze to death. I simply couldn’t. If I lived in a big warm mansion while being a government leader and I were away with my family on vacation in Hawaii or some other balmy spot, I’d instruct my household staff to scour the area near my home each night for homeless people and have them undertake care of the indigent persons until the sheltering pick-up or some other life-serving action happened. I simply would not abandon them to possibly die from extreme cold. Do you think that this sort of kindness that I just described happened for a pitifully cold and crippled man during an extremely icy snowstorm while he lay out on a park bench in front of the White House? Guess. I can also tell you about what I wouldn’t personally do. I wouldn’t ever buy, nor wear, $540 sneakers to a called photo-op meant to show my kindness while I, in a once-a-year nominal incursion, sorted food at a food bank. If I had that kind of money to spend on a mere one pair of fancy footwear, I’d donate it to a charity while knowing that I had enough footy-things already. Moreover, I’d certainly not be so callous as to wear such sneakers when bagging food to make myself look like a good and generous person during some USA volunteer day wherein in advance I’d asked my secretary to call major news companies to photograph me smiling while carrying out service to the indigent poor. How self-serving! How calculating and insincere! …Maybe I’d be an inspiration to others to follow suit were I in that position to show my grinning self giving aid for only an hour or two at a food bank and, yet, what is the real underlying message that I’m sending when I carry out a token, short-term act and dress with great wealth in my outfit? Is my intention to point out the glaring contrast between those in need and my own social and economic advantages? If not, where is my common sense in dressing so lavishly for the staged, once-a-year event? Then, too, values are in the mix. They also are just too strongly in opposition to the values, the directions and intentions in life to care for a poor broken soul on a park bench near their home. I’m truly sorry to be excoriating, but that couple provided no positivism and do not represent me any more than does Hillary C., nor D. Trump. We are far too many, many worlds apart ethically and in terms of intentions to care for life overall! Another way to put the fiercely opposed contrast concerning the oligarchy and democracy comes from Joseph Stiglitz. He presents the dichotomy, the vision’s blunt disparity, well! This overall information fits right in with the Wobbly perspective. Although antiquated since society has shifted since this image was made, it’s basically correct in terms of hierarchy. 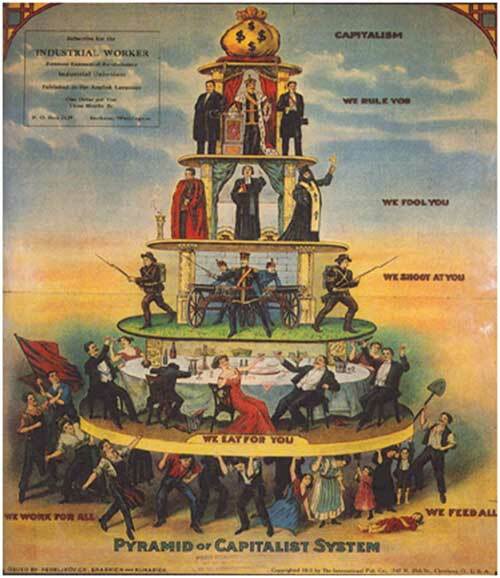 One part missing from the image is the group or class that should be located under the workers at bottom. In the layer that I picture to exist beneath the workers, we have the homeless people living in tents, in cars and on park benches during severe, life-threatening blizzards. This new bottom group comprises some starving people, who are unable to find jobs or who have mental illness so as to slip through the cracks – the abandoned “nothings” of society. Add to the homeless and the war-dead the people ignored in countries undergoing resource shortages and climate change impacts that leave their populations at risk for death. They also are often considered to be the “nothings” of society. … and let’s add, too, to my newly conceived bottom class ignored members of other species whose lives are dismissed as humans rapaciously take more and more away from the natural world. For the first time since the dinosaurs disappeared, humans are driving animals and plants to extinction faster than new species can evolve, one of the world’s experts on biodiversity has warned. 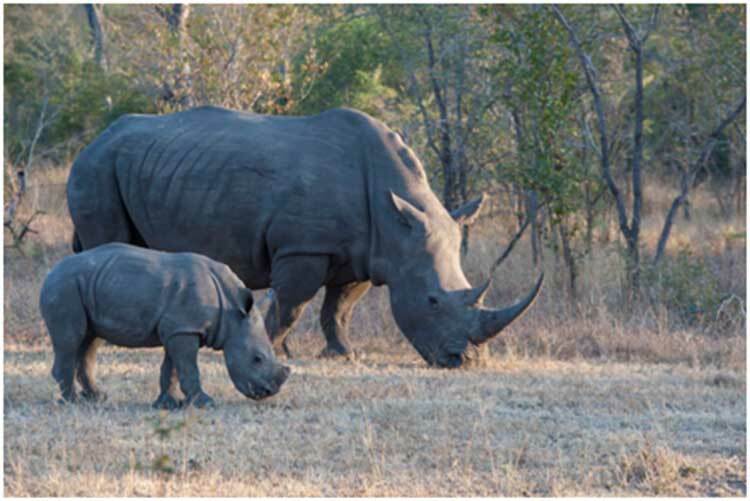 Conservation experts have already signalled that the world is in the grip of the “sixth great extinction” of species, driven by the destruction of natural habitats, hunting, the spread of alien predators and disease, and climate change. Yes, let’s add other species, that are ignored and slated for demise as the Earth is dismantled bit by bit to support economic activities. Heck, let’s add their intact environments, too, on which we depend for oxygen and so much more. They are being torn apart, too. Any country that shuns the worth of and disregards its “own” — literally discarding citizens, sometimes with children, to the streets while including many scarred veterans of foreign wars dumped back onto USA soil and left to fend for themselves in street life – certainly can’t be trusted to treat people of other countries with care, sincere interest and help. It can’t be trusted either to care for other species and the natural world in general. (Donald Trump is proof in point.) How could one imagine an alternative scenario to this abysmal vision existing? If you don’t help your “own,” how can you be expected to truly care for even more remote others? They collectively, those others elsewhere located, are an equal “nothingness” — discards to be bombed, avoided, dismissed or if in resource deficit countries of no value to corporations supported by governments backing them up, nominally helped if at all. In other words, they can be helped in a token way, such as when one works at a food bank once a year and wears fancy shoes. Ditto for the ravaged biosphere. So we, people trying to change the status quo, are ultimately left to our own devises when trying to serve whomever or whatever the latter helpless ones may be in terms of their perceived worthlessness to our economic system as a whole. So it is left to those who genuinely care to carry out an all-out attempt to salvage life. I’ll be blunt. If a society doesn’t care for its most fragile and helpless members, will it do the same for others in other societies somewhere else located across the world? This vision in mind, we do need to glance that one step further. If we, as a species, can’t sufficiently help our own kind in our own or other countries, where do we stand in terms of helping other species or the world overall? Is this shunning of mutual help a basic component that defines humans? Is this absolute neglect our future for generations to come? Where do we stand for supporting generations to come? Will we collectively care for members of our species, other species and the overall environment on which we all depend for life? 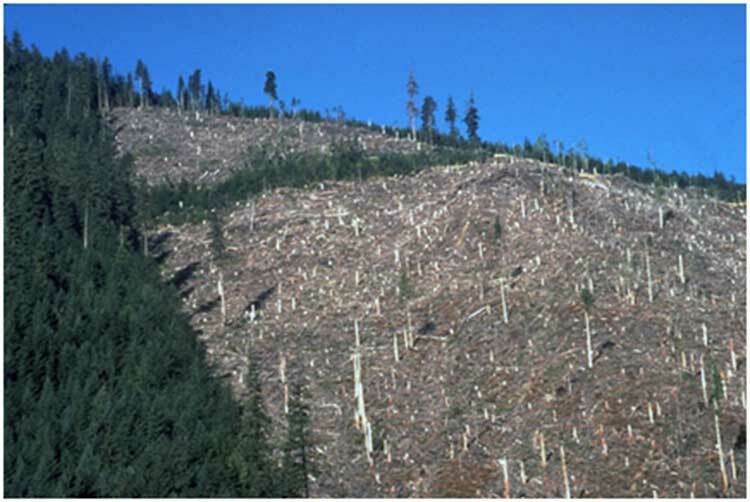 Will members of a callous society take care of the social and ecological whole for our composite good? No? I absolutely refuse to accept this standard! So does my sister described here: The Good Sister, A Model For US All! | Countercurrents. I’d like lots of people to join us in our efforts to improve social and economic systems, and the natural world so as to lift them all into better conditions. If it doesn’t happen, so what? We, relentless, still don’t stop moving to better the world since we consider it both a duty and a privilege. Thus, we stand firm no matter whatever happens. To do nothing is not an option. We all know where that direction leads. She and I absolutely refuse these dysfunctional standards that tear apart the very fabric of societal and environmental life on which we all depend to stay alive. We do so with the force of our entire beings and will do all that we personally can to resist destructive patterns since so much is at stake. This loss of life – human and otherwise — is not the way that we want to live as humans as this direction is sickening and damages us all – everything alive on Earth. So we refuse with fierce adamancy and with every aspect that can be mustered out of ourselves to resist the drift into self-serving nihilation. On account we’re personally pushing to be everything that we are to bring out the best. So we’re focused to be more concerned with a destitute person nearly or literally freezing to death on a park bench than the way that we could look while wearing a cute pair of gotta-have sneakers. How truly fortunate are we! We’re simply configured to reject such self-gratuitous empty fatuousness. Yes, my sister and I are both grateful to be able to discern about whatever is most important in life! It certainly is not in any way related to the self-image that could be portrayed when dressed up to the hilt to look like a “special” person – dress way better than an unprivileged man simply struggling to stay barely alive on a park bench during a potentially killing blizzard! It is so much more that we must with verve and unflagging dedication bring up out of ourselves as we strive our best to support all life forward! Let’s stymie brutality whether posed in the passive form of letting people freeze to death outside of our homes, dismissing the natural world or by being indifferent to missile attacks that our nations carry out against others in order to have dominance in their regions. Please especially let’s not favor pretty sneakers over ignoring the dire needs of close-by others because that’s a start in redirecting our aims to create a better world, a better future for generations to come! So let’s take care of those in dire need close to home first. It could set a precedent for doing the same action elsewhere located rather than to tear apart the rest of the world with missiles, simple lack of help for desperate others and other means to indirectly or directly destroy life, including natural life in the environments around us. As the economy is served to wrench the world apart into broken fragments, we have to resist. What other remedy is there to support betterment since at least it is a small start in improvement? Let’s all have simple minds and not walk on by. It doesn’t take a genius to know the appropriate way to respond to suffering and misery that’s right up in your face. “Walk on by?” No, reject the status quo instead regardless of whether your passion is climate change, overpopulation, homeless people, environmental destruction, the sixth great extinction, resource shortages, starvation, warfare or any combination of these dangers. Come on. Join my sister and me. Don’t walk on by! Sally Dugman is a MA, USA writer. Rich people view charity as ‘ show business’. They donate less and create hype I’m media to create popularity. What is the use of a presidents spouse donating half the amount she has spent on her dressing ? True charity is a penny donated by a suffering woman who desires her donation would be of value. Thus.’ value of donation: is more in the case of poor donors than that of the rich because they part with excess money while the poor part away their own meagre savings for the betterment of their fellow poor. In response to K Sheshu Babu’s comment, I’ll add that in the USA, study after study has shown through factual data that the near poor give more to charity than any other economic group. They are the group nearest to the worry and trauma of poverty, So they are more concerned than others. Their own closeness to the condition raises their empathy, it seems. Oct 6, 2014 – … the richest Americans are donating a smaller share of their incomes to … Less Of Their Incomes To Charity, While Poor Are Donating More. Dec 3, 2013 – The United States was first among the 135 countries surveyed in … 12, at 63 percent) were more likely than Americans to give money to charity. The wealthiest Americans donate 1.3 percent of their income; the poorest, 3.2 percent … Lower-income Americans are presumably no more intrinsically generous (or … The poor tend to give to religious organizations and social-service charities, …. of State Rex Tillerson has arrived in Moscow with a near-impossible mission. Aug 20, 2012 – It turns out that lower-income people tend to donate a much bigger share of … Embedded · Latino USA · NPR Politics Podcast · On Point · Up First … “Now that I have more, I want to give to organizations that provide just basic food for people,” Curtis says. …. “I grew up very poor, on welfare and food stamps.